I got this book at the library, it was one of a bunch of Quick Reads all in similar covers propped on top of a shelf, and I looked through quite a few of them. There were some classics like Animal Farm and some other crime stuff like this, I thought it was a good way of getting casual readers into reading and getting people to feel the accomplishment of finishing a whole book. 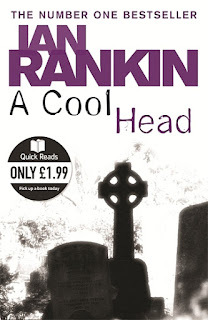 I like Ian Rankin's Rebus novels, and I loved the ones he wrote under the name Jack Harvey, which are all really good thrillers, so I thought I'd give this a go. It's a good short story about an underworld boss and a couple of people who get involved in something without meaning to. I liked it, it was funny in parts and delightfully Rankin the whole way through. I came back off holiday and ended up battling a horrible dental abscess, so something short and easy to read like this was perfect for me. Do you like Rankin's books?